There were rumours from Telluride to TIFF that The Old Man & The Gun would be Robert Redford’s swan song as an actor. He’s since walked that back a bit, which is good news. But if, in the end, the rumours pan out, it would be a worthy way for an acting icon to end his career. The Old Man & The Gun is, on the surface, a low-key, easygoing movie that is funny and charming. But it’s also slightly subversive, nodding to the appeal of the great American anti-hero, a role that Redford played many times in his career. The archetype has arguably been MIA in the era of action movies and superheroes. So, it’s a welcome return. The Old Man & The Gun is based on a real person, Forrest Tucker - who was profiled in a New Yorker article by David Grann that forms the inspiration for this movie. Tucker was a career bank robber who had been in and out of prison numerous times. But his claim to fame was his incredible talent as an escape artist. He escaped 18 times, including a daring breakout from San Quentin. Redford/Spacek in The Old Man & The Gun. He uses a getaway car, doesn’t mean he can fix one. The movie is set in the early ‘80s. Tucker is an older man, still robbing banks in the mid-West. It’s slow-paced crime. He doesn’t wear much of a disguise, just a slightly floppy sunhat, a pasted-on moustache and a trenchcoat. And it’s pretty low-tech. This is the ‘80’s after all, when phones were still attached to walls, and surveillance cameras weren’t on every corner. And Tucker targets small branches, often in small towns. As the film opens he walks into the branch and calmly, politely and reassuringly asks the teller to load up his case with money. After the robbery, Tucker hops into his car and heads out of town. At the roadside, he spies Jewel (Sissy Spacek), whose truck has broken down. Even though he’s not much of a car guy, he stops to help her. That ends up turning into a coffee at a local diner. Tucker’s charm isn’t limited to tellers and bank managers, and Jewel is gracious and intrigued. He doesn’t tell her what his real occupation is, or, for that matter, his real name. You get the sense that Jewel recognizes his evasiveness, but allows it. There’s a lovely playfulness between them. In a movie about these characters set forty years earlier, the next scene would en route to the bedroom. But we’re in a different life stage here, and their affection is warm and slow. This is, tangentially, a movie about older people that doesn’t condescend to stereotypes. They’re just two people of a certain age, and the film takes real pleasure in watching them enjoy each other’s company. Of course, in any movie that has a robber, there is a cop. And here, that is the beleaguered and weary detective, the aptly named Jack Hunt (Casey Affleck). Tucker’s latest robbery falls into Hunt’s territory. As he starts to investigate, Hunt sees a pattern of these small robberies and figures. Witness descriptions give him a dead-on drawing of Tucker, and accounts of just how pleasant he was to deal with. This appeals to Hunt, who seems to admire his prey, and maybe, just maybe, identifies with him. The Old Man & The Gun works with charm, and heart, as an homage to subversive rebellion. Tucker is a not a deliberate outlaw. He has a respect for decency and larger society, but could just never conform. Lowery treats the story like a modern-day Western, where these non-conformist characters carved a romantic archetype of the American west that still has currency. But maybe more interestingly, Tucker is a version of the non-conformist who was so prominent in movies made in the late sixties and early ‘70s, when rebellion against the Vietnam War fired the counterculture. 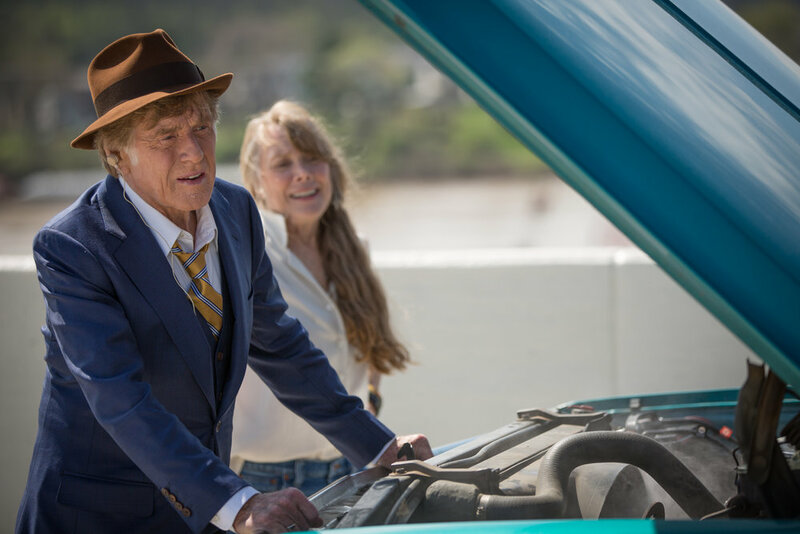 And that makes it a perfect vehicle for Robert Redford. The movie, in its way, pays homage to Redford’s career, and all the times he’s played a charming rebel or an outlaw. It’s also a showcase of who he is as an actor. Perhaps it’s because he’s making so few movies these days, it’s easier to appreciate just how good he is. The Old Man & The Gun is from writer/director David Lowery, who previous made the deeply moving A Ghost Story. Lowery is prone to melancholy in the best way - by which I mean his stories run deep. There’s always a touch of humour, but he lets you see through to the soul of the characters. In The Old Man & The Gun, everything rides on Tucker’s withholding, on Jewel’s watchfulness, on Hunt’s weariness and quiet humour. Like Lowery’s previous work, The Old Man & The Gun goes down easily and yet continues to resonate long after you’ve left the theatre.